To teach and live the Catholic faith within a nurturing family-like community. Teach reverence for life and respect for all. Foster each student's academic potential. 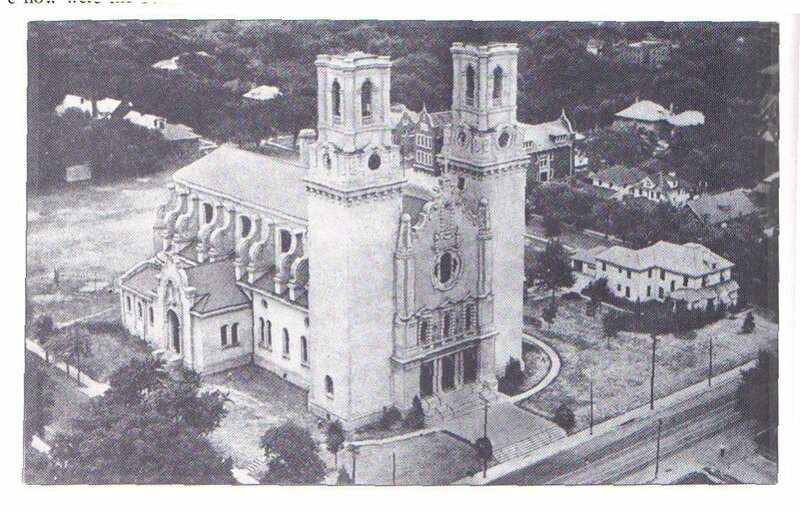 On October 6, 1907, 30,000 people watched the dedication and laying of the cornerstone for St. Cecilia Cathedral. The very next day, St. Cecilia Grade School opened for the first time. Five Sinsinawa Dominican sisters made up the first faculty. 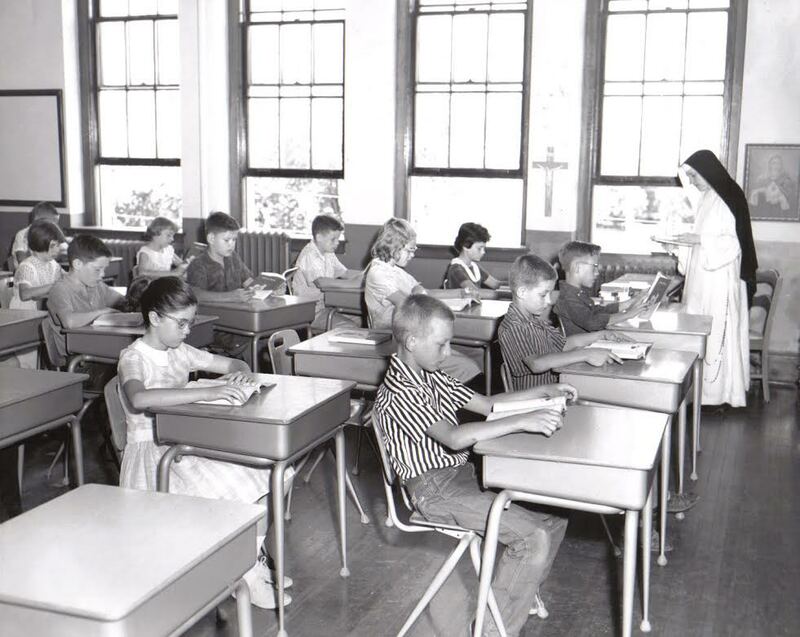 Those sisters laid the foundation for what would become over a century of excellence, equipping St. Cecilia children with an education at once rooted in the Catholic Faith and competitive in the wider world. St. Cecilia graduated its first grade school class in 1908. It had six girls and one boy. By 1914, enrollment went through the roof – literally. The parish added a third floor to the school to accommodate the burgeoning student body: 850 strong. In September, 1919, St. Cecilia High School opened, graduating its first class of 7 students in 1923. When the third floor of the building that now houses the child care became too crowded, a new high school was constructed that would accommodate 500 students. When it opened in 1951, 408 students were enrolled. 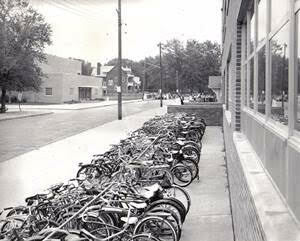 When St. Cecilia Grade School began the 1953 school year with 1,014 students, it was decided that a new grade school building was needed. The new school opened in 1955. It had 28 rooms, including two kindergartens and 18 sections of grades 3 to 8. There were eight classrooms for 1st and 2nd grades in the old building. The opening day of the new school found the grade and high school with one-seventh of all the pupils in Omaha archdiocesan schools. St. Cecilia’s has 1,710 pupils, including 1,216 grade-schoolers. In 1971, the grade school named Bonnie Pryor the principal. A St. Cecilia graduate herself, Mrs. Pryor was the first lay principal, not only for St. Cecilia’s, but for the archdiocese. Later she was honored by the U.S. Department of Education as a National Distinguished Principal in 1985. The following year, 1986, the U.S. Department of Education selected St. Cecilia’s as one of the nation’s best elementary schools. The department’s National Exemplary School Award honored America’s outstanding public and private schools, encouraging other schools and communities to look to them for ideas and inspiration. 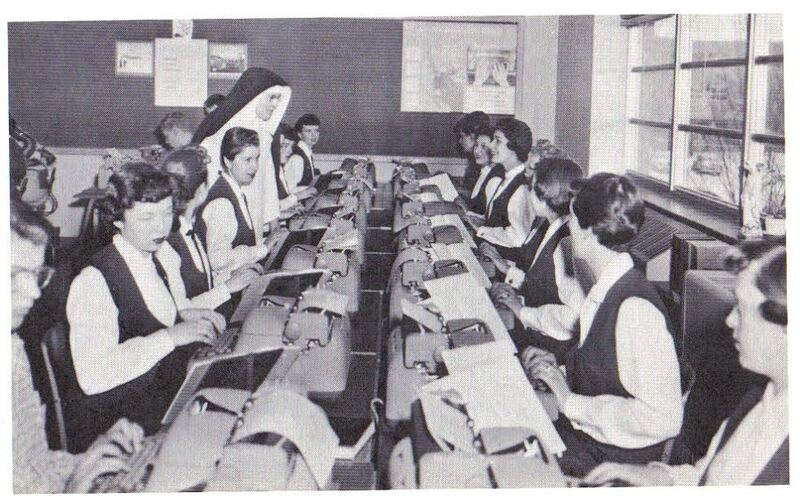 By the late 1970’s, lay teachers outnumbered the sisters and continued their dedication to the students at St. Cecilia School. In 2007, Sr. Marie Patrice became the last Dominican sister to teach at St. Cecilia School. A preschool was added in 1984 and, in 1985, St. Cecilia School opened a child care to support working parents. As Omaha expanded westward, the population shift led to a decrease in enrollment. The 1990’s brought a tough time to the St. Cecilia family. Cathedral High School, beset by financial difficulties and dwindling enrollment, closed its doors in 1994. Even in this tough time, the parish recommitted to the grade school and an educational endowment was established in 1992. In 2007, St. Cecilia School was one of only two schools in Nebraska to receive the National Blue Ribbon Award for Excellence from the U.S. Department of Education. St. Cecilia Cathedral School has been accredited by the State of Nebraska for over 100 years. In 2006, St. Cecilia School was one of two schools to win the Nebraska Arts Council and the Kennedy Center’s first-ever Creative Ticket Schools of Excellence Award for its excellence in music, art, and drama. Also in 2006, the Creighton University Presidential Medallion was presented to St. Cecilia School for its long history of providing academic excellence to the community. In 2007, St. Cecilia School was one of only two schools in Nebraska to receive the National Blue Ribbon Award for Excellence from the U.S. Department of Education. St. Cecilia’s parish, grade school, and neighborhood remain vital to each other. City and neighborhood leaders make the Cathedral a focal point of the Destination Midtown revitalization effort. Even so, St. Cecilia’s is no longer primarily a neighborhood school. It draws students from nearly 40 zip codes, including those who live outside Omaha. Many are the children of parents and grandparents educated at St. Cecilia’s. 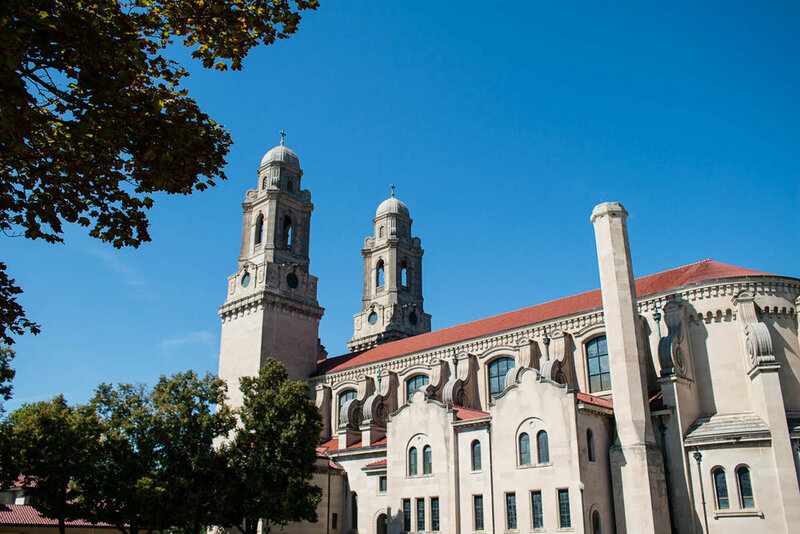 St. Cecilia Cathedral School is proud of its past and looks forward to its next century of excellence in the Omaha community. St. Cecilia School continues to prosper. After the retirement of Bonnie Pryor in 2008, Mrs. Paulette Rourke, a St. Cecilia teacher for 35 years, became the principal. Recent updates to the school include a library/media center, science lab, electronic keyboard lab, Sycamore online data management program, and safety and security upgrades. Resource teachers, an art teacher, and a counselor have been added to the staff. Technology updates continue on a regular basis. The school has full wireless access, data projectors and Apple TV devices in every room, a state-of-the-art computer lab, as well as carts of Chromebooks and iPads for student use in the classrooms. Recent facility updates include the remodeling of the library, office, and computer lab, the addition of a science lab, and the addition of air conditioning to the school building. The first Archdiocese of Omaha elementary school to be accredited by AdvancED, an international academic accreditation organization. One of only two schools in Nebraska to be selected by the U.S. Department of Education as a 2007 No Child Left Behind National Blue Ribbon School. Recognized in 2006 by the Nebraska Alliance for Arts Education and the Kennedy Center for outstanding programs in the arts. On campus Child Care for 6 weeks old to 5 years old. Before and After School "Extended Care." Recognized as a National Exemplary School by the U.S. Department of Education. Up-to-date technology including advanced wireless infrastructure, data projectors, document cameras, Apple TV devices as well as mobile laptop, Chromebook, and iPad carts. Student/device ratio is 2:1. Emphasis at all grade levels on Service Learning projects and helping others . Not only accredited by the Nebraska Department of Education, St. Cecilia School is also accredited by AdvancED, an international academic accreditation organization. St. Cecilia has the longest continuous AdvancED accreditation of any archdiocesan metro elementary school. Several faculty members have been recognized as National Catholic Education Association Distinguished Teachers and were recipients of the Archdiocese of Omaha Outstanding Teacher Award. Eight St. Cecilia faculty members have gone on to be principals at other Catholic schools. St. Cecilia School is extremely proud of our exemplary academic program. High expectations are the key to our students' success. We strive to meet each student where they are and provide them a Catholic learning environment to foster the potential of each student.